I would like to suggest that you add an option for having a larger interface for the program. 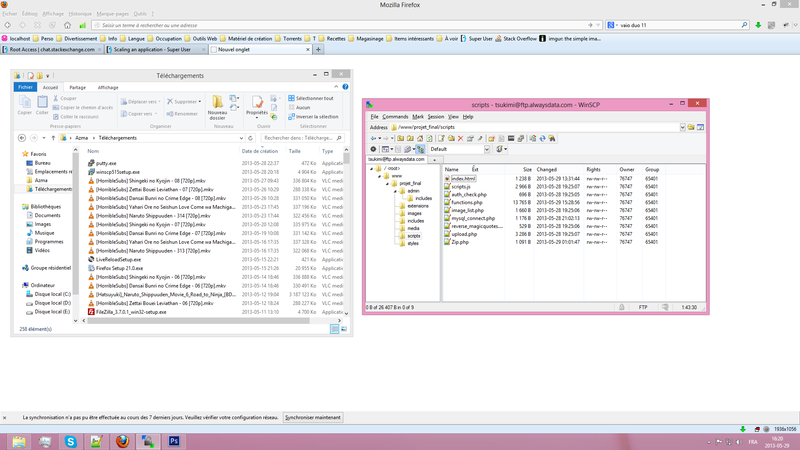 I've just started using WinSCP, and I mostly like it a lot, except for this: it's literally killing my eyes! The folder names are way too small for me to read comfortably (even smaller than standard Windows explorer text, which is already at quite a minimal size), but worst of all, the icons are literally minuscule. Really, I'm having a headache over this. I've tried to look into themes, but I don't even know if any exist. 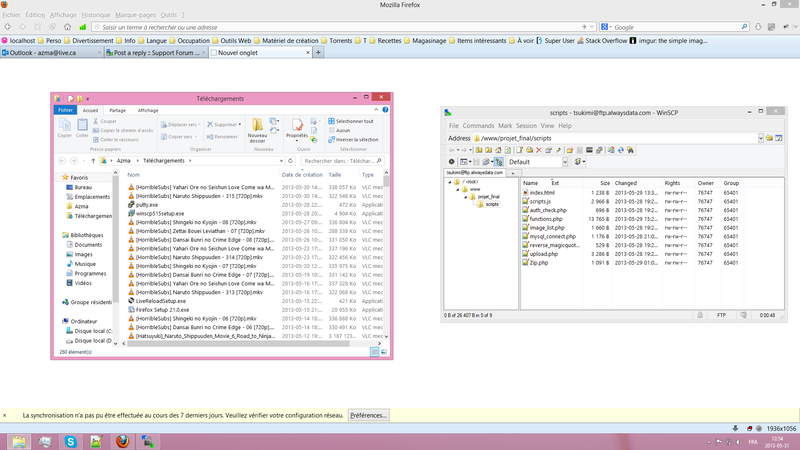 Try searching "winscp theme" and you'll see nothing but iOS stuff. To be honest, I love your software, I really do. But I might just change back to something else because of this. And no, I don't have sight problems not corrected by glasses. What the heck is this, "guest"? I forgot to log in. o.o Anyway, this was posted by me. Can you please attach a screenshot showing how the WinSCP font size and toolbar icons are smaller what that of Windows Explorer? After checking, it appears that the file names are of the same size (even though for some reason they definitely feel smaller), while the things that are in a different font (such as the directory tree and the (not shown) list of stored sessions) are a little bit smaller. There IS an option that affects everything including WinSCP, but that makes pretty much everything huge, uselessly so (normal since it's more of an "accessibility" option), not to mention it makes several things "display funny" because they're not made for being "forced bigger" like that. Also, you can see on the same screenshot the difference between WinSCP's, Windows Explorer and Firefox's (default theme) icons. Windows Explorer icons (those meant to be clicked, not those that indicate what the file is) are generally larger, even if not significantly larger, and if they're not (e.g. the file history button on the right) they're placed in a practical way so that they don't look like a tiny little tile among a bunch of others. Firefox has a one-line display for its icons like WinSCP. Of course, there aren't as many, but it shows what I want to express: when button icons are in a uniform kind of display, in one line, they need to be at least a bit larger, or else they feel impractical to use. Lastly, an additional comparison screenshot, with my current configuration. Thanks for the details. So with your current configuration, what are you missing? Larger font for directory tree and session tabs? Well, for one, if all text could have a uniform size, it wouldn't be bad. And if it were possible to enlarge the whole window's text and/or have it follow Windows' customized sizes, it would be great. If the tiny icons could follow that size customization and/or be customizable separately, it would be perfect. I prefer the current (small) font size - allows more things to be seen on the screen at once. So if you do any enlargement, please make it optional. My GUI priority is usually how to maximize screen real estate and show the most on the screen at one time to help productivity. Yeah, I never saw this as anything but optional. To begin with, whatever the preferences, someone with a small screen/resolution would most likely be quite annoyed by such a thing if it weren't an option. The next beta release will include some improvements. Including consistent use of Windows icon font throughout the main window. While you're in that, I have a minor thing to suggest. Do you think it would be possible to "steal" Explorer icons to fit with the user's version of Windows? Like, uhm, the present icons feel a bit like those we saw back in XP, I think, which looks a bit off. Are you referring to 5.1.x or 5.2.x beta? Because 5.2.x has a new icons.